On Friday I got the slip 'n slide out for the kids to play on. They had a blast. 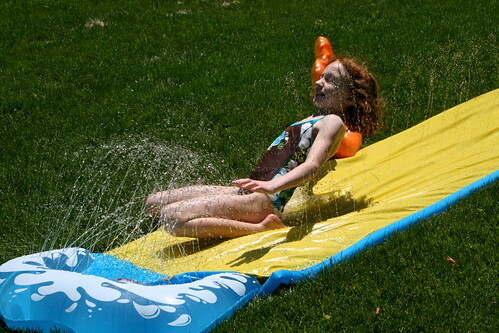 The "slide" of the slip 'n slide seems a lot narrower than I remember it being. And I don't think it's because I'm a grown up now. This one had a bumper full of water for the kids to slide into. Yeah, that lasted for about 20 minutes. They broke it the first day but kept sliding anyway. We also had some bad news. Our first flat tire on the van. 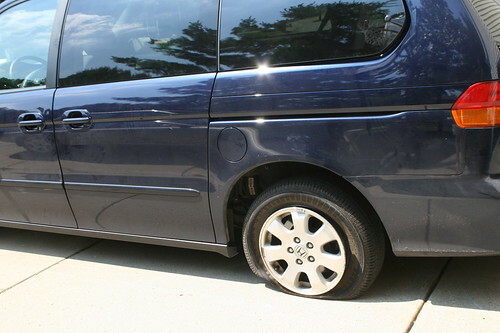 Luckily we got new tires for the van in the winter and it was still under warrantee so it cost us nothing but aggravation. We are also lucky Mickey knows how to remove and put on a tire. I suppose we could have gone on line to find directions. Later we sat down to eat our home made pizza and then watch "Alice in Wonderland". About 20 minutes into the movie the power went out. We hadn't even realized there was a storm outside. Some of us panicked and headed for the basement, taking most of their room with them. Others watched the storm blow through and even went out it in. Crazy. Two of our neighbors lost trees but we only had a limb down. Thankfully the van didn't blow over in the 80 mph winds since it was still jacked up outside. If we had known we'd be without power for 5 days we would have packed up and gone to Jan and Doc's. (Hindsight would be so much better if we could use it before things happen. But then it wouldn't be called hindsight.) Instead we all went to bed hoping the power would be back on the next day. You were out of power for 5 days? Wow! That's really bad! I had no idea it was so bad over there.